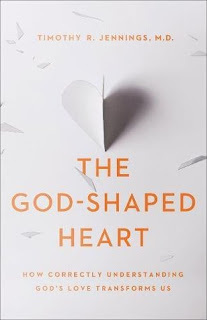 The God Shaped Heart by Timothy Jennings is a book that will shape and transform our view of God's love if we allow it in every area of our life. In this book he hits a variety of topics including healing, love, worship, love, spiritual failure and emotional health. Rather living a life in shame, he takes scripture and shows us how to break free with God's amazing grace and love. This book is a critical in having an understanding of God's infinite love and then discovering it in God's word. I love how each chapter summarizes key points and highlights different aspects of the chapter to tie it up in a nice bow. Jennings did a great job communicating encouragement to the reader and I felt that his thoughts aligned with scripture. I give this book a 4/5 stars. A favorable review was not required. All opinions are my own. Thank you to the publisher for providing a complimentary copy.